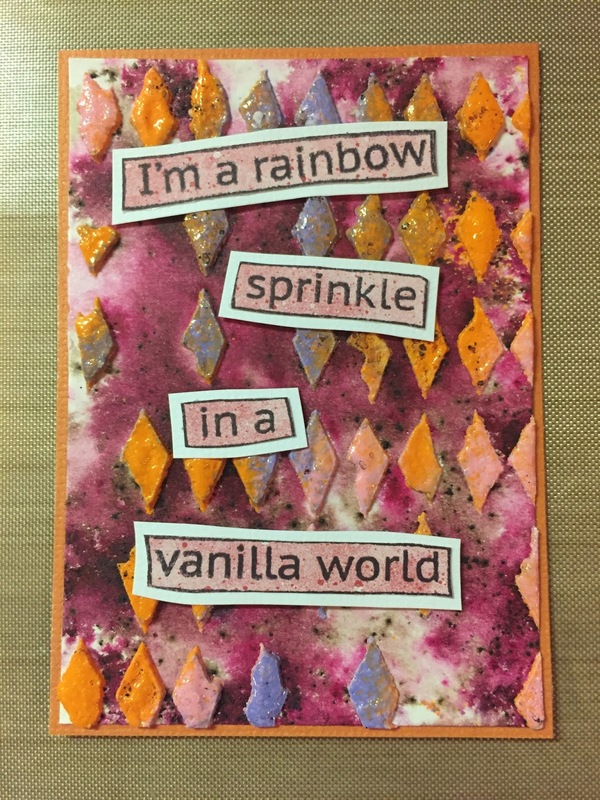 I had a blast making this ATC for Simon Says Stamp Monday Challenge. I started with a plain piece of white card stock. I used embossing paste through a diamond stencil, then immediately sprinkled pink, purple, and orange embossing powder on it. Then I heated it until the powder was completely melted and the embossing paste was nice and puffy. As it dried and cooled the embossing paste shrunk back down some, but it leaves it with a cool squishy texture. I then sprinkled Raspberry infusions on the ATC and sprayed it with water, dried and blotted until I liked it. I was actually very shocked at how cool it turned out. Then I layered it up on a piece of orange card stock. 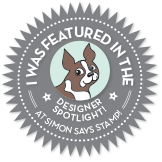 Then I went to my dylusions stamps and found the perfect one. I stamped the phrase on a piece of pink spotty paper, cut it out, then stuck it to white card stock and cut it out again. Then I stuck it on the ATC. Simple but very fun ATC!! Very fun and I love that background!!! !